If you don’t know how we came to see California Guitar Trio (CGT), you didn’t read my previous post. Last night was a typical evening for us at BB King’s. We had excellent seats, and thoroughly enjoyed our meals, including a fabulous chocolate martini for me too. Yummy. CGT is three guitarists who are each individually amazing, but together, are mind-bogglingly good! Paul Richards (whose diary mentions BB King and he posts some really good photos of the group as well), Bert Lams and Hideyo Moriya. Each of them (by default) has a very different sound for their amplified acoustic guitars, so you can close you eyes and still distinguish which one of them is playing. As Paul’s diary notes, last night they had Tony Levin sitting in with them. Paul congratulated Tony for winning Bass Players Magazine award for Best Bass Player just the night before! If you read the string of bands that Tony has played with in the first paragraph of this entry, including many of my favorite groups, you won’t be surprised! He is amazing, and he sat in for the majority of the numbers they played. While there is a similarity to Acoustic Alchemy, which drew me to wanting to hear them, they really aren’t all that similar. Acoustic Alchemy is all Jazz, all the time. They are also more than just guitars (though that’s their calling card! ), as they have many more instruments accompanying them. They also tend to be more consistent in being melodic. CGT is more creative in some ways (in this sense Acoustic Alchemy is more commercial). They also play many more styles of music. Without changing guitars, but definitely by changing the electronics on the amplifiers, they perform hard rock, classical, jazz, etc., and all of the styles, brilliantly. In addition, they are just plain fun when they are performing, and it’s contagious. They played their own arrangement of Beethoven’s Pastoral, gorgeous beyond description. They also did a version of Beethoven’s Fifth, which was funky, and really cool. When they said “Thanks and goodnight”, the crowd went crazy (us included) and all instantly shot up in the air for a standing ovation. We all stood until they came back out. They played one terrific song, and then said that they would finally play the single most requested guitar song in history, that they never used to play. They then proceeded to play Freebird by Lynyrd Skynyrd (those of you who read my post about Treble, will now understand the small world nature of hearing two different groups, on the same day, in different venues, covering two of Lynyrd Skynyrd’s famous songs, one a cappella, and one only instrumental!). They started out playing it in a funky reggae style. It was cute and fun, but as my regular readers already know, I’m not typically crazy for fooling around with classics. However, after building up the momentum, they hit their electronics, and wailed as brilliantly (on acoustic guitars!) as the original version by Lynyrd Skynyrd. Simply amazing, and they brought the house down. So, now they say goodnight again, and the crowd gives them another rousing standing ovation. They unplug their guitars, and start to head off again, when they stop, and Paul says that we should all be extremely quiet, as they are going to try another experiment. He tells us that all three of their guitars are really soft-sounding, so we’ll have to huddle up because they are going to play one final song, unplugged. They stepped out to the very edge of the stage, and played Bohemian Rhapsody by Queen. Lead guitar replaced the voice. You really had to listen closely, but it was one of the most gorgeous and amazing things I’ve ever heard. Mystical, magical, perfect, etc. At least once, we all missed a few notes when they did something clever, and most of the crowd couldn’t help but chuckle together. They then announce that they’ve been recording the concert live, in real-time, and that they have a high-speed CD duplicator there, and that if we want, we can wait 10-15 minutes, and purchase a CD of tonight’s show. Of course, we (and most of the crowd!) couldn’t resist such an offer. I bought ours after a brief wait on a long line (I was near the front, thankfully), and bought four additional CD’s. Three were CGT and the fourth was Bert Lams doing Bach Preludes on the Steel Guitar (recall that I recently mentioned that classical guitar is my favorite!). I’ve listened to a little of Bert’s CD today, and it’s fantastic! All three of them signed our Live CD. A night we will never forget, with a group that I now count way up among my favorites! I had never heard about CGT, so I looked them up on the web, and listened to some samples. They reminded me a lot of Acoustic Alchemy (my favorite Jazz group), so I had an interest in seeing them live. That said, we were planning on coming up to the house for the weekend, after finishing up our long-lost friends week. I mentioned this to Lois, and she suggested that we get the tickets, and either spend the weekend in NYC, or come in and return on Sunday. I was reluctant, but Lois pressed me to get the tickets. So, when we walked to Wicked on Tuesday, we stopped in at BB King’s, and bought tickets for Sunday night. The next day, Lois firmly decided that we would spend the weekend in NYC. Once that was decided, I remembered that I noticed something intriguing in the Joe’s Pub newsletter. They had a Sunday Brunch concert with an all-female a cappella group named Treble. While we were waiting on line to see Kathy Mattea the next day, I ran in and bought two tickets to see Treble for Sunday at noon. This was our first time for brunch at Joe’s Pub. They do a very nice job, as they do for dinner as well. We each had different paninis, and both enjoyed them. Finally, the music. Treble is nine women who sing a cappella. They rotate the lead singer in most songs. The remaining women either harmonize (on occasion) with the lead, or create sounds that mimic different instruments (including drums, bass, horns, cymbals, etc.). They are too egalitarian. While they all sing very well, a number of them are simply not lead material. It’s socially nice that they give each of them a whirl at the mic, but in the end, they aren’t doing the group a favor. Their selection for the performance could stand improvement. I’ll have a little more to say on this subject below. Their arrangements could also stand some improvement in a number of cases. This is highly related to the next point, which is perhaps the most important complaint (of ours). They spend way too much energy (and talent!) mimicking instruments (in particular drums and cymbals). There is way too little actual harmony, for such talented a group of singers, and so many of them to boot! Backing up for a second, Joe’s Pub was somewhere between 1/2 to 2/3’s full. We were both reasonably impressed that a group like this could draw that much of a crowd (even though Joe’s is a very small venue) on a Sunday at noon. That said, we had the overwhelming sense that we were either the only, or two of a handful of people who weren’t specifically friends or family of the members of the group. We had no problem with that, but we’re pointing it out to say that it would have been really hard for a group like this to get a nice-sized crowd for a Sunday brunch concert. We weren’t going to buy their CD (which they were selling there) for a few reasons which I won’t mention. But, there was one song that they did, Time, which simply blew us away. It turns out that it’s a song by Chantal Kreviazuk. We didn’t know that until we looked it up today. Lois went up to talk to the person selling the CD, and in the end, decided to buy it. We’re very glad we did. In addition to a stunning recording of Time, there are a number of nice tracks on the CD that they didn’t do in the live show. That’s one of the reasons that I mentioned that their selection wasn’t that great at the show, clearly, they have better material. This time, the Girlyman reference will be really easy to work in. They should pay Doris Muramatsu whatever she would demand in order to create harmonies for them. She’s a certifiable genius, and we can’t even imagine what she could do with more than the three voices that she arranges with Girlyman. It’s OK if on occasion, they show off their ability to mimic instruments, but if they highlighted their harmonies, they could be something extremely special! I’m too lazy to listen to them all now (sorry), but there is one song on the album that has very little instrumentation and it’s very beautiful. At the other end of the spectrum, if they don’t want specialized harmonies, they should spend a lot of time listening to the Mormon Tabernacle Choir, and go for that kind of sound. Both Doris and the Choir came to my mind while I was listening to Treble. So, if you like a cappella, and perhaps even enjoy the mimicking of instruments with human voices, you should really enjoy their CD immensely. We’re glad we saw them, and glad we bought the CD, but really hope that they decide to become more professional and make it as a result. There were two recurring themes this week, long-lost friends are seen in person and serendipity in everything we did (sometimes related to long-lost friends, sometimes not). In this post, I mentioned our long-lost friends from our vacation in Vail in 1987! That kicked the week off, so officially, it began on Friday evening at dinner. For many years, Lois and I lived on the upper east side. Lois lived in the building for many years before I moved in with her. She had a very good friend in the building there, that I too befriended, and we very much enjoyed her company. When we bought the house, we lost touch with her. That was 18 years ago. Lois has felt badly about that for a very long time. A few months ago, she tracked her down. She’s still in our old building (we can’t blame her, she has one of the nicest apartments in Manhattan!). They had one aborted attempt to get together, but yesterday, the two of them got together for lunch (I had a board call, so I couldn’t join them), and they had a wonderful time catching up. Lois and I intend to go see her when we are back in the city in the future. While I’ve had many really good friends over the years, on any number of levels, he probably easily qualifies as my best friend. I have one friend from kindergarten who I likely know longer (assuming this friend is correct about when we met) 😉 but we’re not as close as I am with this one. Ironically, the kindergarten friend is the only other person from high school (yes, we all went to school together for a very long time!) that I remain in touch with. I speak with him once or twice a year, and this week happened to be one of those times, when we ended up chatting for an hour. Of course, I didn’t see him in person this week, so it only qualifies partially for long-lost friends week. Back to the first grade friend. He married someone roughly 25 years ago who is not easy to be around. After five years of trying, as much as both Lois and I liked my friend, we ended up forcefully separating from any contact with his wife, and unfortunately, him as well. We didn’t really interact with him for nearly 15 years! I don’t even recall how, but somehow we agreed to have dinner with him six years ago, and lo and behold, he told us that he was separated, headed for divorce. Needless to say, we were ecstatic. He brought along his new girlfriend (now wife! ), and instantly loved her. For the next two years, we spent a ton of time with them, and grew to love her as much as we love him. Unfortunately, four years ago, they moved to Thailand! They keep beating us up to come for a long visit there, and we want to, badly, but with our crazy schedule, it isn’t going to happen any time soon. So, now we see them once or twice a year, when they visit NY. We were lucky enough that they were going to be in town only two nights on this trip, last night, and this coming Monday. We were free last night (serendipity), and we had a fabulous time catching up with them over a leisurely Mexican dinner with some margaritas greasing the wheels. Finally, there is a couple that we became very friendly with in 1998 when Lois and the woman worked together on behalf of an international charity. We remained friendly with them even though they lived in California. We saw them a number of times until roughly 2001, when we lost physical touch, but maintained an email relationship. After all this time, the woman came to NYC last night for some charity event, and Lois got to have a nice lunch with her today, and then she came back to the apartment so I got to spend some time catching up as well. What a treat! We’ll see her again in December when she returns to the city with her mom, whom we’re looking forward to meeting. So, long-lost friends week was nearly literally a week, as it started last Friday at dinner, and ended today in the afternoon after lunch and a visit in our apartment. Since we regularly frequent Joe’s Pub (as loyal readers already know), I read their regular email newsletter reasonably carefully, to spot performers that we already know, as well as attempt to discover ones we might enjoy. 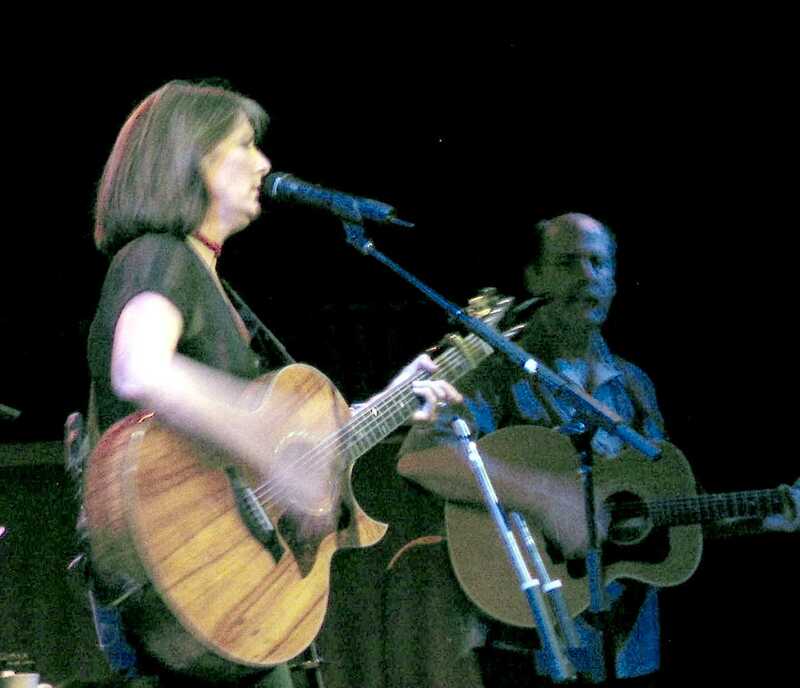 A few weeks back, while we were at Zope, I noticed that Kathy Mattea was scheduled to be there on October 24th, 2007. This was a very exciting discovery. She is one of Lois’ all-time favorites. Through her, we also discovered Ceili Rain (she did fabulous covers of both Love Travels and That’s All the Lumber You Sent). Kathy was a certifiable Country music superstar for a very long time. In the past 2+ years, she seemed to disappear (at least somewhat) from the scene. It was mildly surprising to me that she was playing a venue as small as Joe’s Pub, and therefore not surprising that she sold it out in minutes. In her hey day, I imagine she could have easily sold out Radio City Music Hall, like Martina McBride did. It turns out, she is doing a new project to bring back songs of the coal miners, with an album coming out in January, that she’s touring to promote and work on at the moment. Two weeks ago, I checked the web site again on a whim. There was one ticket available! I immediately offered Lois that I would snag it, and she could go without me. I would have been thrilled for her to see Kathy, even if I had to miss it. She wasn’t interested. But, she immediately called Joe’s Pub, and told them how often we come, etc., and could they possibly see it in their hearts to release one more ticket? A few days later, Lois called to ask whether it was possible that dinner reservations might open up (as the one ticket did). They said that it wasn’t likely, but that we should call back a few days before the show. She did, and they said that she should call back the day of the show. She did, and they said that they couldn’t release a reservation, but if we showed up really early, they could practically guarantee that we’d be seated for dinner. We did, and they did, so everyone ended up happy. We had excellent seats, and had an amazing dinner (they always do a good job!). I had a perfect chocolate martini as well. 🙂 We were seated at a table for four, so we ended up chatted with a very nice couple who were seated next to us. They ordered dishes I never tasted there, and both raved about their meals as well. The woman’s steak looked outstanding! Kathy’s voice isn’t in the same league as Martina McBride, or even Alison Krauss for that matter (obviously, all in my own opinion, no need to publicly disagree with me on this). That said, she’s still amazing. Her voice is powerful, emotive and moving. Her song selection is outstanding, and she’s a wonderful guitarist. Half of the show was the new coal project, and half were previous hits (which she encouraged the crowd to sign along during the chorus, and they/we happily obliged). She had a three-member band playing with her. Bill Cooley on acoustic guitar. Dave Roe on the upright bass. Eamonn O’Rourke on the fiddle and mandolin (unfortunately, a quick search doesn’t reveal any web site dedicated to this amazing musician!). All three are amazing enough to deserve their own mentions independent of Kathy. I am a guitar-loving nut. I like all styles of guitar, from classical through to screaming rock. While classical is probably my favorite, a close second is someone who can do wonders with an acoustic guitar. Among my favorites forever has been David Bromberg. The man is a genius with an acoustic guitar. That said, he isn’t the cleanest guitar player, as on occasion, in his attempts to dazzle (which he achieves so many times), he can even (gasp) miss a note (no, say it ain’t so!). Bill Cooley is possibly the greatest acoustic guitarist I have ever heard! I’m not sure I can describe exactly why, though I tried to last night when Lois asked me why I felt that way. His fingers are so fast it’s almost unbelievable. He plays in a variety of styles. His leads are so clean and clear. He’s one of the few guitarists where you don’t hear the transitional screeches of the strings as his hands slide up and down the neck. He plays brilliantly both softly (when he’s accompanying Kathy as the solo instrument), and when he has to pound it out with all of the instruments going full bore. He’s been touring with Kathy since 1990. She’s crazy if she ever lets him go. Simply brilliant! Dave Roe is a top-notch bass player. In addition to normal bass playing, he plays a style that includes slapping the body of the bass with his palm, while strumming the strings with his fingers, creating the sounds that a drum might make (they had no drummer on the stage last night), making for a wonderful sound coming from one instrument. He’s truly gifted, and sings harmonies with Kathy as well. 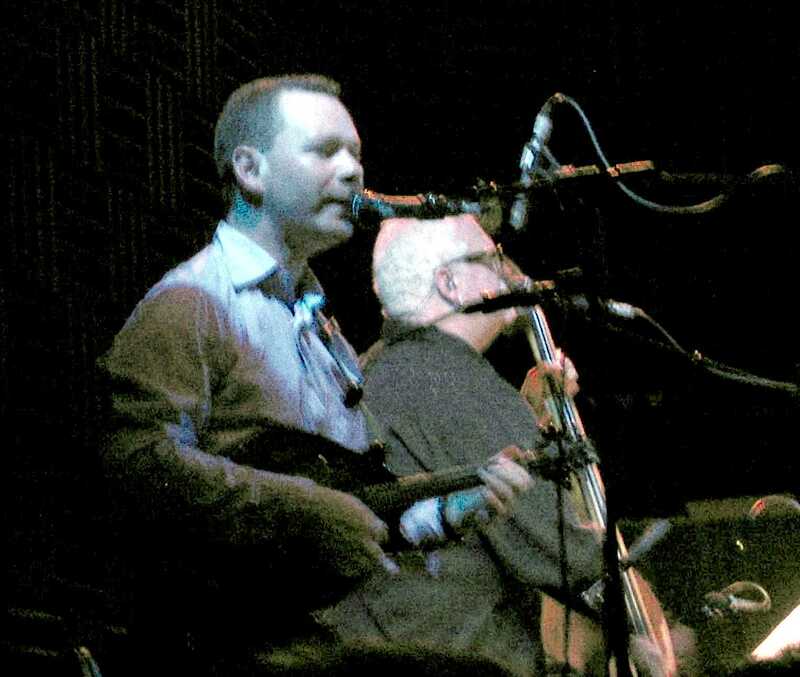 Eamonn O’Rourke is an outstanding mandolin player. His fiddle playing is even better. In the past few years, I’ve seen some amazing fiddle work. While I wouldn’t say that Eamonn is the best (like I did for Bill Cooley above), he certainly isn’t far from it. He also sings harmonies with Kathy. Anyway, a truly outstanding band, to complement a truly outstanding performer in Kathy. She has a wonderful stage presence, and connects deeply with the audience. She came out for an encore and did two songs. The first was her alone, no instruments. Wow. Another song from the coal project, and her vocal power was overwhelming (in the most positive way that statement can be taken!). The second number was completely instrumental, an Irish-style jig. Kathy played both her normal guitar, but also broke out two penny-whistles. Man, she’s very talented, and can play that whistle beautifully. We left on an ultra-high note. On another topic, management chided me for not mentioning Girlyman in my CDB post on Sunday. They weren’t going to take any punitive action (this time), until Wes commented on the blog, and they realized that they were looking weak in public. So, they are now insisting that I put in a solid mention of Girlyman, or risk losing my blogging privileges. The last time I wrote about Wicked, we were close to calling it our last time, given the disappointing performances of the two leads. Two people whom I don’t know commented on my blog (one is rare enough), and one, Vickie, pointed out that the Elphaba lead was going to change to Stephanie J. Block. I did a quick search, and sure enough, on October 9th, 2007, both Elphaba and Glinda were to be replaced. Glinda would be played by Annaleigh Ashford. We were scheduled to return to NY late on the 11th, so I searched for tickets starting the following week. Sure enough, there were two tickets for the 16th at 7pm. I don’t know what made me hesitate, but I figured I should give us a little wiggle room in case we ended up staying at Zope a little longer. So, when I found two tickets available for the following Tuesday, October 23rd, 2007, I snagged them. I considered writing a long blog entry yesterday about using an American Express card with Rewards Points on it for this purchase, but I changed my mind. The bottom line is that we got one of the tickets for free, which was way cool! Awesome tickets: fifth row, dead center. So serendipity number one, a stranger comments on my blog, and I discover that we might be able to wash away the memory of the last two leads in one gulp, without waiting too long. Serendipity number two, that amazing tickets are available for the night we prefer (Tuesday’s are 7pm, instead of 8pm, and we’re old folk), and we end up getting one of them for free. We got there plenty early, and relaxed and read the playbill. The Gershwin Theater is one of the best, so it’s not uncomfortable to sit in their seats for an extended period. In this post, I mentioned that our long-lost friends were going to see Wicked on Saturday. I also mentioned that we were likely to see them again for brunch on Sunday, which we did. They told us that they loved Wicked, but that Elphaba was played by an understudy in the matinee. They loved her, but we both instantly got a severe chill (recalling that our worst experience was with an Elphaba understudy!). We were hopeful that by Tuesday night, whatever caused Stephanie J. Block to miss Saturday, would be taken care of. Then on Sunday, Local One (the stagehands union) authorized a strike against the theater owners. Oh oh… I was feeling unlucky that we hadn’t grabbed the tickets for the 16th, avoided the strike, and gotten to see Stephanie (assuming she wasn’t sub’ed for then as well). Serendipity number three, the strike vote turned out to be authorization only. They intend to strike during the peak holiday season, if they don’t reach a compromise before that. On the pleasant surprise front, the original Madame Morrible has returned for another round, Carole Shelley. We really liked Carol Kane a lot (we saw her four times), and Jayne Houdyshell who replaced her (who we saw twice). That said, Carole Shelley plays the role much darker, and sings much better than either of them, so it was a real treat to see the person we’ve listened to on the CD so many times. Glinda is the first solo voice that you hear right after the introduction. The very first song that she sings has so many high notes that only a true soprano can hit them unwaveringly and cleanly. That’s how we knew that the last Glinda would be disappointing, immediately. Annaleigh Ashford was instantly impressive. For the remainder of the show, she didn’t disappoint in a single note, or her acting either. We loved Kate Reinders in the role, but Annaleigh is at least as good. Her voice is stupendous, and she didn’t fool around with the songs in the least! Annaleigh’s face shares some features with Kristin Chenoweth, and they both have a great sense of comedic timing. So, can she sing? Yes, and no. She started her first solo with a tad more styling than I would have cared for, but she didn’t overdo it. She did a good job in general, but the one complaint is that her voice (on occasion) tends to be a bit thin. Her acting was excellent, and she had good chemistry with Annaleigh and the others. Lois was slightly more critical of Caissie, notably on the thinness of her voice, and that she looked a little too innocent on stage (in other words, she seems like a very sweet person). The Fiyero understudy was excellent (though we saw the main person last time, and he was excellent as well), and the Boq understudy was excellent too, so no disappointments there at all! It was another magical night seeing Wicked, and we’re both very glad we did it again. We’re unlikely to go again, until we can finally get our friends from Richmond up to see it, which we hope happens while Annaleigh is still in it, and perhaps we’ll be lucky enough to catch Stephanie J. Block (assuming she’s as good as some reviews claim). all, a very good qualifier week! mountain of chips. Still, I know I was correct. would have been the smart thing to do anyway. course, he had the AA, and I lost (as I deserved to). Last night, Lois and I went to BB King’s to see the Charlie Daniels Band (CDB). In the past, I’ve mentioned that Lois is a huge Country music fan, and that I have (happily) come along for the ride. The truth is that I have loved CDB since I was a teen (their first album came out 33 years ago, and I’m pretty sure I still have the vinyl of it from my teens! ), but I guess I never made the connection that it was “Country” that I was enjoying. So, we were both very excited to go see a band we both loved, at a place we both love. We got there right before the doors opened and got very good seats not too far from the stage. I ended up eating something quite appropriate for a CDB concert, a Pulled Pork sandwich. They do it really well at BB King. CDB (and Charlie in particular) were simply spectacular. The crowd could not have been more over-the-moon for him/them. Roughly 1/2 the audience gave them a standing ovation after every number (not typical for most acts). My leg didn’t stop stomping (right, not just tapping), the entire show. One person in the crowd yelled out “Happy Birthday yesterday Charlie”. To which Charlie responded, “Well, not quite. I turn 71 next Sunday!” (a week from today). At that point, the entire audience sang “Happy Birthday” to him. Wow, 71, and his fingers still fly on the guitar, and he can fiddle with the best of them as well! His singing voice is as strong and smooth as ever as well. The band did one completely instrumental number, with every member in the band taking at least one solo, to show off their individual virtuosity. They are awesome. One giant difference from nearly every concert we’ve seen in NYC ever. In most, if there is anything even remotely smacking of politics, it turns into Bush Bashing instantly, and the crowd typically eats it up. This is, after all, New York City. Charlie was not political, but he was 100% in support of our troops. When he dedicated a song to them (In America), the crowd went nuts, and could not have been more supportive of the troops, and of CDB’s homage to them, etc. It was an amazing difference in crowd sentiment to what we’re used to. It was refreshing! As many of you know, Joe’s Pub is one of our favorite places to see a concert. We’re going again later this week, but that in itself is a good enough story to merit its own blog after the show. None of you may recall how we came to discover Joe’s Pub in the first place. During that original The Duhks concert, they discussed on stage that they were really good friends with a group called The Mammals, and that they were influenced by them. That same week, The New York Times wrote an article about this genre, and included both The Duhks and The Mammals in the article, with glowing reviews of both. Ever since then, I’ve wanted to see The Mammals live, but the one time they were scheduled to be in NY, we were at Zope, and were not able to rearrange our schedule. The person The Duhks most talked about was Ruth Unger (who’s father Jay Unger was/is also a musician). Another member of The Mammals is Tao Rodriguez-Seeger, Pete Seeger’s grandson! In another recent post, I talked about how wonderful The Tarrytown Music Hall is. Two months ago, I noticed that they had The Mammals scheduled for last night. We were already going to be in NY, so this was perfect. I snapped up two very good orchestra seats, and was really looking forward to the show. In the afternoons, Lois and I did things we rarely even think of doing, let alone actually do. One day, we rented a canoe and paddled around a gorgeous mountain lake. Another day we took a gondola (cable car) up to one of the higher mountains. On another day, we went horse-back riding. Now comes the connection with this adventure, and The Mammals disappointment. Lois was startled into stopping, and sure enough, the baby stopped crying as well. The rest of the ride was uneventful. Afterwards, we chatted and laughed with the woman. We agreed to meet later that night for dinner. We had a lovely meal with her and her husband (who was not there for the horse incident) and were very glad to make two new (and very interesting) friends. Not surprisingly, we never saw them again (they lived in Colorado Springs at the time). Lois stayed in touch by phone for a while with the woman, but eventually, that connection faded as well. Last year, Lois did some searches on Google and found the husband’s name as a Department Chairman at Notre Dame. It would be too coincidental for this not to be the right person, so she wrote to him, and indeed, we found them again. They are seeing Wicked this afternoon (another amazing coincidence?!? ), but were free on Friday night for dinner. Of course, if The Mammals weren’t canceled, we would have missed them. We got together for a great meal and great conversation at our favorite Mexican restaurant, El Rio Grande, and we hope to see them for brunch again tomorrow morning, before they leave town again. It turns out that he’s on leave this year from Notre Dame, on a research fellowship at Princeton, so we will likely get to see them a few more times before they head back to Indiana. I’m a complete sucker for sitcoms. Even stupid ones make me laugh. Yes, I can distinguish between a good one and a horrible one, but like I said, even most horrible ones make me laugh. Unfortunately, the same isn’t true for Lois. She really loves to laugh, and there are some sitcoms that can really set her off (in the positive sense), but she can’t tolerate stupidity, even if the aim of that is just to get you to laugh. That puts us at odds. There are a number of shows that I enjoy, that she can’t stand, that I totally understand why. Enter the DVR. I can record those shows, and watch them at some point when Lois isn’t interested in watching TV. I try fewer new shows than I might otherwise, just because I know I’ll be watching them alone. This year, I decided to try Chuck (on NBC) and Bing Bang Theory (on CBS). I set the DVR to tape both, and we left for our normal trip to Zope. When we got back, I saw three episodes of Bing Bang Theory, but only two of Chuck. I realized that since I was now taping (how quaint, I meant recording) most shows in HD, even though I have a 320GB disk, I filled it up. The first episode of Chuck got erased automatically. Some shows (Pushing Daisies for example) go down much smoother if you see the pilot episode, where they set the entire premise. Chuck seemed like that would be the case. A quick search on Google found the above link to the show instantly. Sure enough, they offered full episodes online, for free. There are certain things that I don’t do, even though I can afford them. For example, there’s simply no way that I would have paid $1.99 to download the episode from iTunes (if that were the only place it was available). I enjoyed the episode. Actually, I enjoyed the premise more than the actual episode. There were a number of weak moments in the episode, but I’m interested enough to watch the two I’ve recorded already, and if those are good too, I’ll watch the rest of the season. So, NBC got a viewer for the show by making past episodes available online, for free. Even if you assume that I will fast forward through every commercial that sits on my DVR, I sat through the Sprint sponsorship online (better than nothing for them! ), and while Nielsen doesn’t count me, if they collect anonymous stats from FiOS, they’ll know that I record Chuck, which will count toward their viewership. I still haven’t watched any of the Bing Bang Theory episodes, so I don’t know if I’ll like them. For an example of a show that I’ll watch, that Lois won’t, you can check out Kelsey Grammer and Patricia Heaton’s new show, Back to You (on Fox). We were both interested in watching this new show, as we loved Frasier (Lois, especially). I liked Everybody Loves Raymond. Lois didn’t, but she appreciates Patricia Heaton (we also saw her live on Broadway with Tony Shaloub). Anyway, Back to You qualifies as an incredibly stupid show, that is filled with cheap laughs. The key word (for me) is laughs, cheap or otherwise. I definitely laugh out loud at a number of the lines and situations, but everything about the show is just downright stupid. So, kudos to NBC (perhaps others, but that’s the only one I’ve needed and tried so far). Won my entry on Friday. Poor start. I had J2o in the big blind on the first hand. And now won one, so I’m up a drop again. drawing next to dead all the way through. ARGH!